no, my camera didn’t flip the photo – that’s really how their sign is designed! The patty is homemade, which I must give them due credit for. It contained a lot of beans, celery, carrots, yellow squash, zucchini, and onions, which all sound great – but it was too mushy. It would have greatly benefitted from being cooked a bit more until the outside was a bit crisp, and some of the carrot pieces inside were not fully cooked either, and were unpleasantly crunchy. The flavoring was actually quite nice though – I ate a chunk of the patty on its own, after it fell out of the bun, and I really enjoyed the way it was seasoned. The toppings were generous – tomato, lettuce, avocado (a good amount, too, they didn’t skimp like some places do! 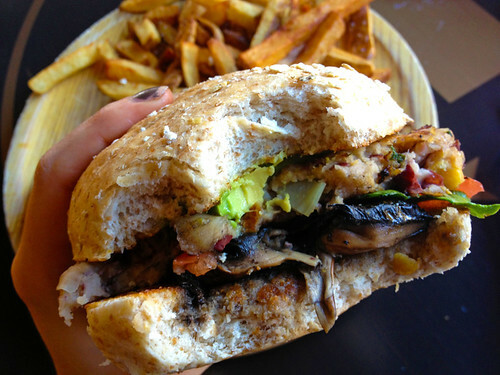 ), sprouts, red onion, and a Portobello – which I, mushroom-hater than I am, even enjoyed! (it was well-marinated). I skipped the goat cheese, but that is one of the toppings that is included, if you want it. The bun (wheat) was a bit too thick and dense to eat with all the patty and toppings inside. And it was surprisingly cold in temperature compared to the patty, as though it had just come out of the fridge, although it looked like it had been lightly toasted on one side. While the staff told me the patty is vegan (and if you order it without the cheese, the toppings are vegan too), they said they did not know if the bun was vegan because they do not make the buns there. So, eat at your own risk if you are concerned the bun might have dairy in it. 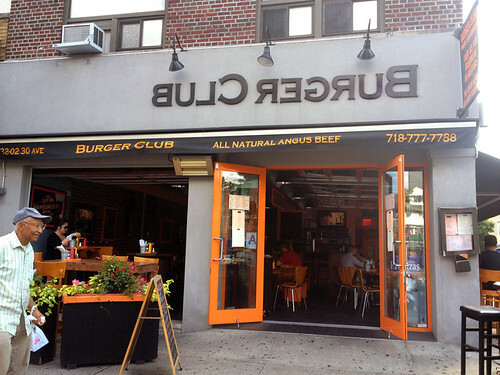 I’ve heard other people mention that this place seems like it is trying to be Astoria’s next Bare Burger, and the similarities are certainly there – Burger Club definitely has an extensive and creative menu, it’s not just another boring burger joint. 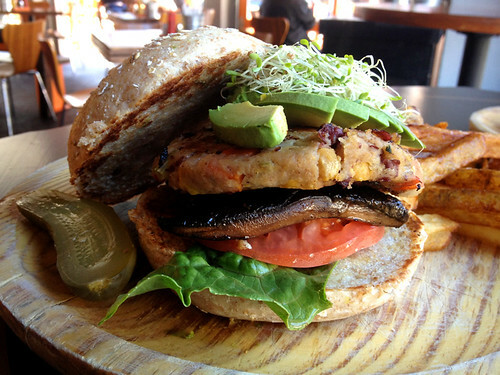 But Bare Burger’s veggie burger is still superior, in my opinion.